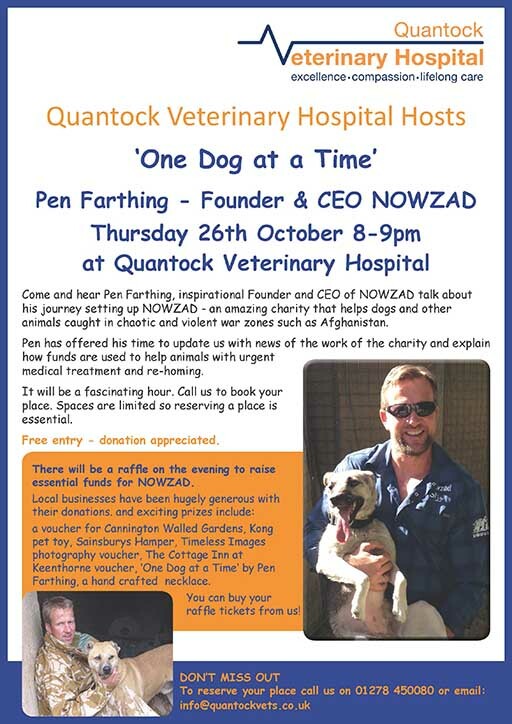 On Thursday October 26th at 8.00pm Pen Farthing, inspirational Founder and CEO of Nowzad will be coming to Quantock Veterinary Hospital in Bridgwater to give a fascintaing talk about the work of Nowzad and how the charity tries to help animals caught in the war zones of Afghanistan. Give us a call 01278 450080 if you’d like a ticket for Pen’s talk ‘One Day at a Time’. Places are strictly limited so do book soon. There’s no charge for your ticket but donations to the charity to help support their excellent work are appreciated. There will also be an exciting raffle on the evening with some fabulous prizes to win. Don’t miss out!